Infinera introduced a hardware-based implementation of Shared Mesh Protection, an emerging industry standard that ensures network resiliency with protection against multiple failures while simultaneously lowering costs by eliminating the need to provision backup links for every live connection. 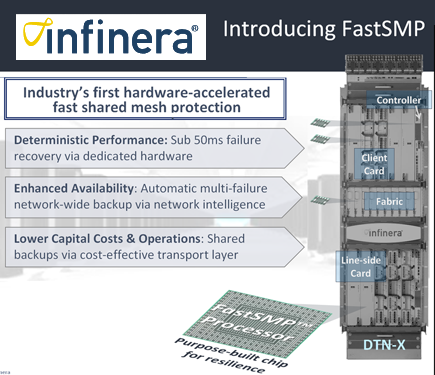 Infinera's new FastSMP leverages a purpose-built, FastSMP acceleration processor on every line card of its DTN-X platform. This enables recovery from multiple-failures in less than 50 milliseconds (ms). This hardware chip is pre-installed on the DTN-X and can be enabled via a simple software upgrade ensuring complete investment protection for customers building their networks with the DTN-X. Infinera has shipped more than 2,000 100G ports to date and every port shipped is ready to be upgraded to FastSMP. Deterministic Protection: providing recovery for multiple failures within 50ms versus software-based Shared Mesh Restoration which can take multiple seconds to recover. Enhanced Availability: FastSMP leverages intelligent GMPLS control to provide multiple backups with continuous real-time path re-computation ensuring better survivability for every protected service. Cost-effective Deployment: in contrast to 1+1 protection, it allows for sharing of backup resources with priority pre-emption to lower overall capex and opex costs. Infinera said that because FastSMP utilizes the digital transport layer it provides better network economics than packet-based solutions and recovers from local as well as remote failures across thousands of nodes within 50ms. "Pacnet’s unique position is its ability to offer true long haul submarine mesh architecture on its core network within the APAC region,” said Andy Lumsden, Pacnet Chief Technology Officer. “Our selection of the DTN-X has provided new levels of scale for our network allowing us to accommodate customer traffic and deliver high capacity services faster than our competitors. The combination of the Infinera DTN-X platform and its hardware-accelerated FastSMP™ approach will provide Pacnet with a combination of resiliency, capacity and flexibility needed to meet the highest demands of our customers." Infinera has filed patents for its hardware-accelerated FastSMP™ and is expected to start delivering multi-failure protection and restoration capabilities in 2013. Coriant, the new optical transport company originating with Nokia Siemens Networks' Optical Networks business unit, is making its public debut at this week's OFC/NFOEC event in Anaheim, California. In December 2012, Marlin Equity Partners agreed to acquire and privatize the Optical Networks business unit of Nokia Siemens Networks. The deal is expected to close in the first half of 2013. 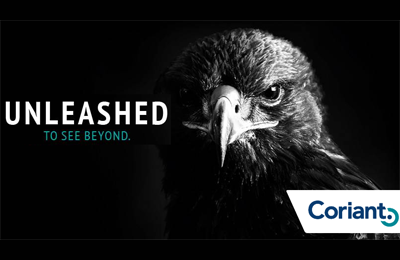 Coriant, which will be headquartered in Munich, Germany, said its mission is to bring to market proven 100G/OTN scalability, intelligent control, and extensive automation capabilities with a software defned, end-to-end approach for more agile service creation. 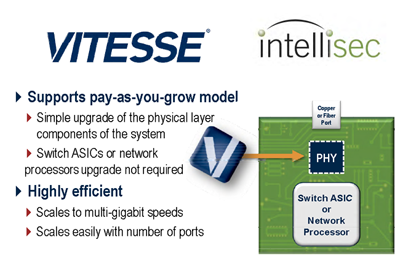 Vitesse Semiconductor introduced Intellisec, a patent-pending means of extending IEEE 802.1AE MACsec encryption end-to-end over any network, including multi-operator and cloud-based networks, independent of the network’s awareness of security protocols. Traditionally, MACsec has been implemented link by link, making it difficult to deploy in service provider networks where latency over multi-hop connections becomes an issue. Vitesse's Intellisec solves the end-to-end problem by implementing MACsec in the PHY. services, such as MEF EVCs, MPLS L2VPNs and Data Center Interconnect, across the network. independent of the network’s awareness of security protocols. 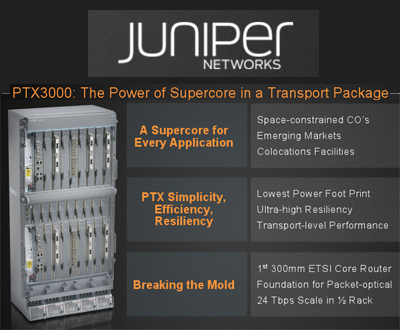 Juniper Networks unveiled a smaller version of its PTX packet transport router for the converged super core, which allows network operators to converge their networks from nationwide backbones down to the metro core. Since introducing the PTX platform two years ago, Juniper said it has 20 cutomers, including the London Internet Exchange, Optus Australia, Verizon and XO Communications. 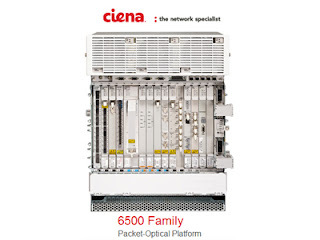 The product family also includes the PTX5000, which uses a Junos Express chipset that is optimized for high capacity transport and features the on-chip traffic engineering, full delay bandwidth buffers, algorithms optimized for packet transport and embedded error detection required to support differentiated traffic types. The new Juniper PTX3000 Packet Transport Router offers 24 Tbps of capacity and yet measures only 10.6 inches in depth, allowing it to be installed in space and energy constrained environments. In addition, Juniper Networks announced an integrated packet-transport physical interface card (PIC) with two-ports of line rate 100 Gigabit forwarding for the entire PTX family, which will enable service providers to cost effectively interconnect sites more than 2000 kilometers (1243 miles) apart. The PTX3000 packet transport router consumes 1200 watts of entry power for forwarding traffic. "The Converged Supercore is an innovative platform that enhances service provider economics while providing greater value to their subscribers. Following on the heels of the revolutionary PTX5000, the PTX3000 extends these benefits to new markets and geographies with a solution that is tailored for their specific needs," stated Rami Rahim, executive vice president, Platform Systems Division, Juniper Networks. Pacnet, a leading provider of integrated network and technology solutions in the Asia-Pacific region, has deployed the Infinera DTN-X platform, featuring 500G long-haul super-channels. The DTN-X platform enables Pacnet to deliver 100 Gbps services. The deployment is believed to be the largest regional deployment of 100 Gbps technology to date. Financial terms were not disclosed. 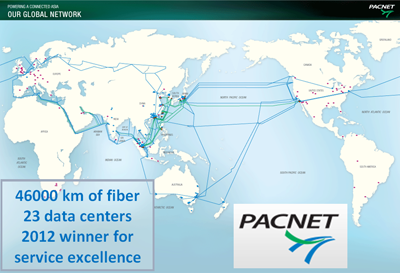 Pacnet owns and operates EAC and C2C, Asia’s leading state-of-the-art fiber optic submarine cable networks with 21 cable landing stations extending from India to the U.S. The network spans 46,800 km and serves global customers with a comprehensive range of network and managed services. "The Infinera DTN-X FlexCoherent modulation capabilities, integrated control plane, and seamless subsea to terrestrial integration with the existing network further enhances our Data Center connectivity and network virtualization strategy," said Andy Lumsden, Pacnet Chief Technology Officer. "The ability to deliver and commission the DTN-X rapidly meant that our network upgrade was fully deployed within nine weeks, allowing us to deliver services to customers with a high level of confidence and resilience. The Infinera solution greatly advances our Layer 3 to Optical convergence and Network-as-a-Service initiatives." CenturyLink is deploying Ciena's 6500 Packet-Optical Platform with WaveLogic coherent optical technology to modernize and upgrade its network that spans more than 50 metropolitan locations across the United States. The upgrade allows CenturyLink to offer 1GE, 10GE, 100GE and equivalent wavelengths. The 6500 platform will also offer integrated packet switching which gives CenturyLink agility in the delivery of groomed Ethernet services to its enterprise customers. CenturyLink is the third largest telecommunications company in the U.S. Financial terms were not disclosed. Approximately 1,600 employees worldwide will lose their jobs in the restructuring. This includes about 500-700 positions in Europe, including 400 to 600 positions in Sweden and 50 to 80 positions in Germany. Carlo Ferro has been appointed President and CEO of ST-Ericsson to carry out the transition phase. "Ericsson continues to believe that the thin modems hold a strategic value to the wireless industry. With this move Ericsson will create a highly focused "thin modem only" operation - an area in which both parents have invested significant amounts to establish industry leading technology and Intellectual Property," said Hans Vestberg, President and CEO, Ericsson and Chairman of the Board of Directors. AppliedMicro introduced a standalone OTN processor that can be used to enable 10 x 10G line cards for OTN cross connect and Packet-Optical Transport System (P-OTS) applications. The new TPO215 processor delivers advanced framing, mapping and multiplexing, while supporting 10 x 10G channels for a total capacity of 100G. The device, which is part of the company's portfolio of "SoftSilicon" OTN processors, makes use of the partial reconfiguration function of Altera's Stratix V field-programmable gate array (FPGA) silicon in a way that is completely seamless to the user and effectively quadruples the size of the silicon. The TPO215 provides optical data unit (ODU) mapping. The device can map any 8-10G client signal to ODUflex/ODU2, in compliance with all ITU standardized mapping methods. The device can also perform hierarchical (de)multiplexing between ODU2 and ODU0/ODU1/ODUflex containers. In addition, AppliedMicro noted that its TPO125 device also features OTNsec encryption, a new security feature developed by AppliedMicro to ensure comprehensive security during transport of information over "shared" networks. Unlike traditional encryption methods that only encrypt packets or client payloads, OTNsec security encrypts the entire container for transport across an OTN network and provides secure transport of any OTN client, including Fibre Channel, SONET and Ethernet. Westell Technologies agreed to acquire and Kentrox for $30 million in cash. Kentrox provides monitoring, management and control of remote sites, such as cell sites and towers. Its customers include major wireless and fixed-line telecommunications carriers, tower providers, cable and broadband network providers, utility companies, and enterprises. The company had revenues of approximately $29 million for the 12 months ended December 31, 2012. "Kentrox is a perfect fit with our growth strategy,” said Rick Gilbert, Westell’s chairman and chief executive officer. “The company is a leader in providing intelligent site management solutions with a wireless focus, significant software content, and global reach. 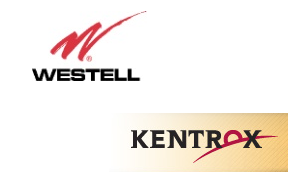 Kentrox has outstanding customers and solutions that complement Westell’s. In addition, it has an impressive team, excellent capabilities and real sales momentum. We expect the acquisition to propel us to about $80 million in annual revenue and add to earnings in fiscal 2014, which starts on April 1." TeliaSonera International Carrier (TSIC) announced the activation of 100G across its North American network, connecting 23 cities across the continent. This add to the company's 100G European network, which stretches from Madrid to Moscow. 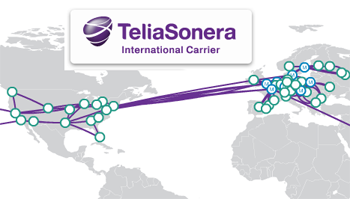 TSIC is also looking at options to upgrade its trans-Atlantic connection to 100G. This will create a seamless 100G enabled network encompassing Europe and North America. TSIS is using NSN’s hiT 7300 platform for 100G in Europe and has deployed Infinera’s DTN-X platform for 100G in North America.